I spent 3 days over 2 weekends at Kala Ghoda Art festival and was amazed by it. 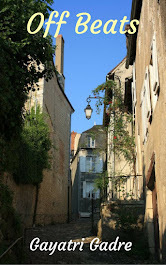 The variety of art displays, performances, workshops and the lively atmosphere in general rejuvenated me. I am not an expert in art, but many trips to art galleries and museums have opened my mind to these things over period of time. Though I may not understand the fine things of arts, I have learnt to appreciate them. There were many things I saw, observed, learnt during these 3 days, which has helped me grow a bit as an individual. First visit was kind of acclimatization visit, getting hang of things, how to register for workshop, what are the stalls about and enjoying art displays as much as possible. 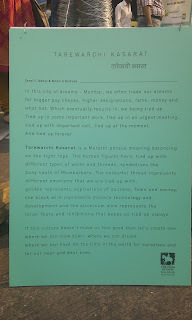 One thing I found out was this is a must-visit event in Mumbai, if you really enjoy doing something outside your daily 'home-to-work and back to home' routine. 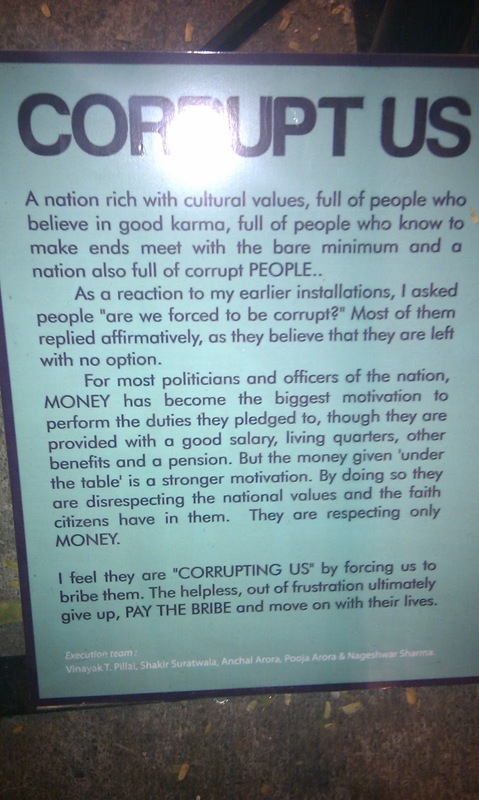 What I hated most about the event was, it doesn’t matter if it is a law, rule, art or elders telling us, we (Indians) adamantly refuse to listen and care. It was one event which gave me not only insight about arts, but also about human behavior. I am covering few of the art displays which appealed to me and few of my first hand experiences. While I know that these experiences are not all, to go by and there is much much more to the festival and its attendees; it deeply saddens me how the educated masses are worse than illiterate people in this ‘thriving to become world leader’ country. 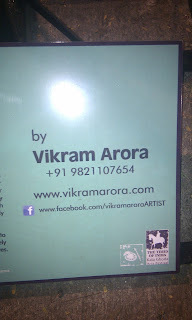 One art display which appealed to me most was by VikramArora. It was simple, straight forward and most importantly to the point. No subtle, hidden message, quite bold. 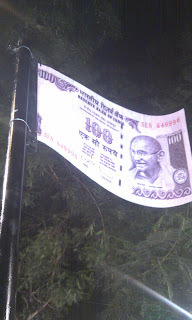 There were rows of politicians looking up and saluting the flag, the catch was flag had a Rs. 100 note instead of the Indian national flag. You don’t need an art expert or read the description to understand what the display means. Another display I liked - there was an artificial tree with eyes made of paper, in the place of tree leaves. There were numerous social issues addressed all around the tree. A person willing to make change had to take pledge by taking one eye off that tree and replace it with a green leaf (made of paper) provided by the artist himself. After taking the pledge one should keep the paper eye where he/she can see it frequently (reminding self of the pledge). One which has lingered in my mind till date was a big box made out of mouse traps. All those mouse traps held pieces of paper with drawings and notes written. Some of those notes contained drawing of a car, or house, or pictures of celebrities or notes like 'I wanted to become a pilot', 'I wish I could become an actor' and so on. It took me a while to understand the meaning of it. They were all unfulfilled dreams, caught in a trap of day to day problems. It kind of inspired me to keep fighting to follow my heart and to pursue my dreams, small or big. Another one was called 'Tarewarchi kasarat'. 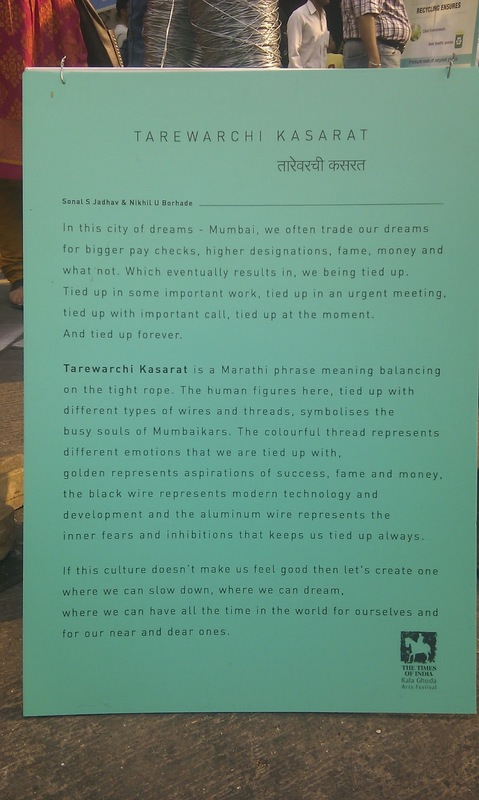 The artist had depicted how people in this city of dreams sacrifice or exchange their dreams for higher pay checks, money, fame etc. There were many workshops too. I attended one with Sucheta Pal on Zumba. She was brilliant with limitless energy. Zumba is a combination of dance and fitness. The best part about it is, you don't need any knowledge or experience of dancing at all. You are free to dance your own way, and you burn up to 500 calories per hour. It was more of a dance party than a fitness workshop, and it felt great. There was a 'Saree draping workshop by Kalpana Shah' which intrigued me. The lady is a professional saree draper, and has draped numerous celebrities in innovative saree styles. First 5 minutes of the workshop I was completely awestruck. She made me believe that there is always scope for improvement, and there are always better ways to do things. In a country where more than 50% of women wear saree or know how to wear one, the lady has created a profession out of it, and she is brilliant.She showed us numerous different styles of draping a saree which included classic Indian style, Gujrati style, Bengali style, lehenga style, Cocktail party (or Mumtaz style), Corporate, wearing 2 sarees together and couple of more and what not. Who can imagine wearing 2 sarees, when it is a gigantic task to wear and carry one. She showed us different celebrities wearing saree draped by her in movies and fashion shows. She also shared her tips generously on nitty-gritty of saree draping. She opened our mind to the fact that you have whole 6 yards of saree, be creative and make best use of it. Sometimes we are so used to following things which have been around for years or generation, we just forget to challenge it, or forget to think out of box. This charming lady taught me to think out of box and creatively about everything. Do check her website, as she also conducts personalised saree draping workshops, trainings and has also published a book on the same. Hope you learn few tricks from her too. There were some folk artists displaying their art. Here are videos of Kathputali by Rajasthani folk artist. There were lot many workshops for kids too on pottery, music, craft and other creating stuff. They were mainly targeted to bridge the gap in current education system. Every human has a left hemisphere which is more logical (which helps us with science, maths) and right hemisphere which is more for arts. Current education system in India is so focused on Science and Maths that we forget to teach our kids about all the artistic and creative things. This creates imbalance as left hemisphere grows better than the right hemisphere. Ideally both hemisphere grow together. So if you are a parent to a kid, I strongly recommend you a visit to Kala ghoda. 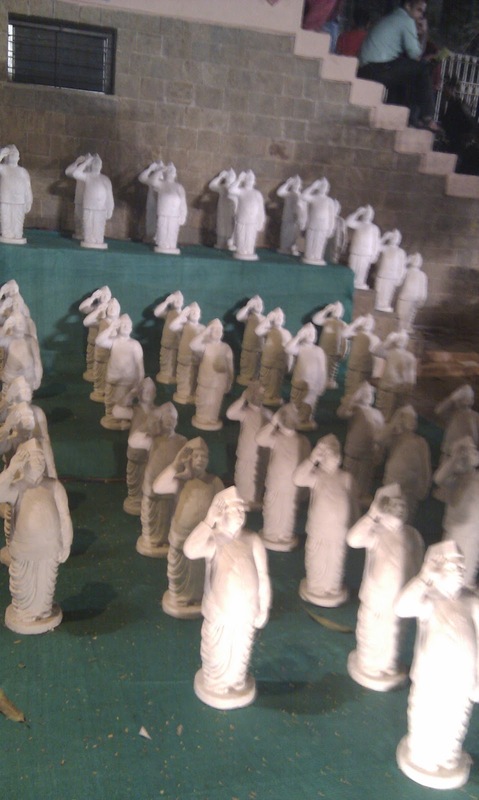 Here is a video of kids learning pottery at Chhatrapati Shivaji Museum. 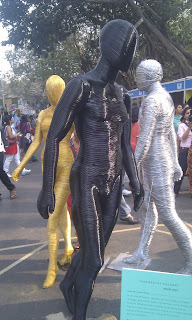 Kala Ghoda Arts festival is a must visit event in Mumbai for all the art lovers. If you appreciate good food, music, dance, arts, books, workshops, creativity and lively atmosphere, then you just cant afford to miss it. Hope to see you there next year.